Cleopatras Gold Video Slot Guide & Review - Casino Answers! Cleopatra’s Gold is a 5-reel, 20-line video slot developed by Realtime Gaming, featuring a wild substitute symbol, scatter wins, multipliers, a free spins feature and a progressive jackpot. You can play the Cleopatra’s Gold Real-Series Video Slot at USA-friendly Winpalace Casino and Rushmore Casino. Bets on the Cleopatra’s Gold slot machine are $0.02, $0.03, $0.04, $0.05, $0.06, $0.07, $0.08, $0.09, $0.10, $0.25, $0.50, $1, $2.50 and $5 per line. You can play from 1-20 paylines. The lowest you can bet on the Cleopatra’s Gold slot game is a penny up to the highest total bet of $100 per spin. To manually bring the reels to a halt during a spin, hit the “Stop” button to activate the skill stop feature. To play the Cleopatra’s Gold video slot, hit the “Spin” button once you have selected your wager. The Cleopatra symbol is the highest paying symbol on the Cleopatra’s Gold video slot. 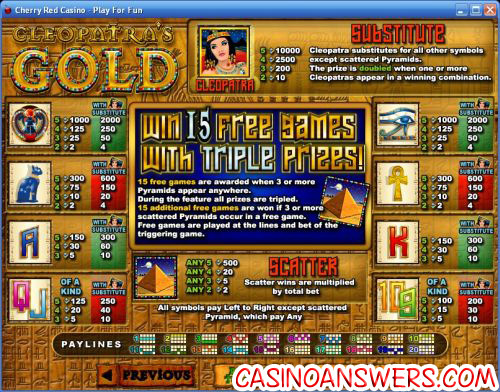 You can win the 10,000 coin top fixed payout when 5 Cleopatra symbols land on a selected payline. The Cleopatra symbol is wild and substitutes for all other symbol except for the Scattered Pyramid symbol. Whenever the Cleopatra symbol participates in a winning combination, your prize will be doubled. You can win big when you land five Cleopatra symbols in a row at Winpalace Casino! The Pyramid is Cleopatra’s Gold scatter symbol. It will pay out 2X, 5X, 20X or 500X your total bet if 2, 3, 4 or 5 Scattered Pyramids land anywhere on the reels. When three or more Pyramids appear on the reels, you will win 15 free spins with a 3X multiplier, so all of your winnings will be tripled. If you re-trigger the free spins feature, you will win 15 additional free spins. Free games are played at the lines and bet of the triggering game. The progressive jackpot on the Cleopatra’s Gold online slot game is currently at $29,263 and growing fast! To win the Cleopatra’s Gold progressive jackpot, all you have to do is play. No winning combinations are required to win the jackpot, because it is won randomly. Progressive Jackpot wins are added to other wins. Random Jackpot contribution is no more than 1.5% of total Return to Player. Hit the “Autoplay” button to open the autoplay settings on the Cleopatra’s Gold slot game. You will be able to set the number of spins, set it to stop when the jackpot is won, stop if a win exceeds or equals (any amount you input), stop on any win, stop if your balance increases/decreases by any amount you input and stop once the feature is triggered. You can stop the autoplay mode on Cleopatra’s Gold by using the “Stop Auto” button. To speed up the gameplay, simply hit the “Turbo Play” button in the autoplay settings. If you’ve played many of the excellent Real-Series Video Slots before, you will recognize the quality of graphics, sound effects and overall presentation in addition to the in-game features such as progressive jackpots, great payouts and free spins features. The only thing Cleopatra’s Gold is lacking is a bonus game, but we can definitely forgive that exclusion here. The Cleopatra’s Gold video slot fits right in with the other amazing RTG video slots, which you can see for yourself by signing up and making a deposit at Winpalace Casino! Are American players allowed to play Cleopatra’s Gold for real money? Players from the United States are welcome to play Cleopatra’s Gold and many other exciting slot games at both Winpalace Casino and Rushmore Casino. Where can I find a free Flash game of the Cleopatra’s Gold video slot? Cleopatra’s Gold is one of the select RTG casino games offered at Winpalace Flash Casino and Rushmore Flash Casino for instant play. You can play for free or play for real money. If you experience any difficulties with the Instant Play Flash software, make sure you have the latest version of Adobe Flash Player. Where can I find other slot games featuring Cleopatra? Cleopatra is commonly found on slot machines and video slots. You can play the Cleo Queen of Egypt Video Slot at Casino Joy, the Cleopatra slot at Lucky Ace Casino, Cleopatra’s Coins at Slots Jackpot Casino and Cleopatra’s Pyramid at Caribbean Gold Casino. She also makes a guest appearance in RTG’s Caesar’s Empire Video Slot. 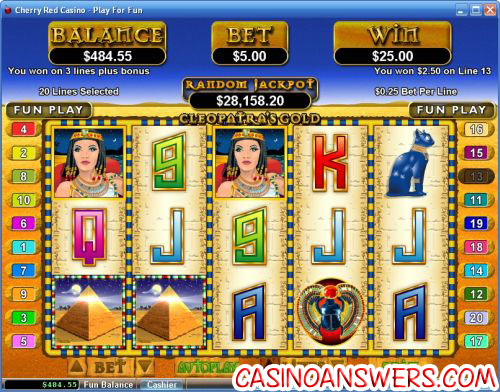 For more Egyptian-themed slot machines, please read our complete list of Egyptian slots. What is the difference between this slot and Jackpot Cleopatra’s Gold? The difference between the standard version of Cleopatra’s Gold and Jackpot Cleopatra’s Gold is that Jackpot Cleopatra’s Gold is a $1 progressive jackpot slot. Each spin on the Jackpot Cleopatra’s Gold progressive jackpot slot is fixed at $1. The Jackpot version is a 25-line video slot, as opposed to a 20-line video slot. In addition to that, the Jackpot Cleopatra’s Gold progressive jackpot is much higher (at the time of this writing at an astounding $106,264). You can also play Jackpot Cleopatra’s Gold at Winpalace Casino and Rushmore Casino.